Bank Broker Dealers continue to make substantial progress on reducing the average number of clients managed by their branch based advisors. That is one of the key findings of this year’s Kehrer Bielan Bank Broker Dealer Survey Report. Banks have been criticized for allowing their advisors to accumulate so many clients that they cannot serve all of them appropriately, resulting in underserved clients and low revenue productivity from the existing book, but the typical advisor in a bank-owned BD serviced 454 client households last year, down 12% from the previous year. This finding may come as a surprise to many industry observers, who have talked of bank-based advisors working with over a thousand clients. They may be looking at the wrong metric – the number of accounts per advisor, instead of the number of clients. Many clients have multiple accounts managed by the advisor as part of the overall client relationship, and firms want advisors to develop multiple account relationships with clients. In fact, the typical advisor in a bank-owned BD is responsible for 831 investment accounts, or almost 2 accounts per client, on average. 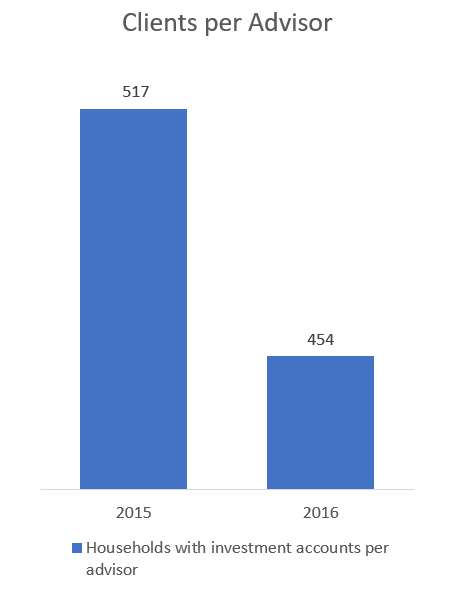 Clearly the appropriate measure of an advisor’s client load is the number of households [the financial decision making unit] that the advisor works with. While our data show that bank BDs are making great strides in reducing the size of an advisor’s book, they clearly can do better. The survey also found that the average revenue on assets in bank BDs is just 58 basis points, about the same as the past few years. Only by reducing the client load further can we expect advisors to be able dig deeper with each client, embrace financial planning and managed money, meet the client’s life insurance needs, and capture a larger share of their wallet. The survey report examines trends of key metrics, including penetration of the bank’s opportunity, profitability, advisor productivity, advisor coverage, referral generation, and product mix. The 2016-2017 Kehrer Bielan Bank Broker Dealer Survey Report covers 25 of the leading bank-owned broker dealers, which collectively employ almost 4,200 advisors. The participants received a copy of the survey report and can purchase a customized dashboard comparing their performance to their peers across four dozen metrics.